Although the precise origin of Ikebana is unknown, it is thought to have come to Japan as part of Buddhist practice when Buddhism reached Japan in the 6th century. The offering of flowers on the altar in honor of Buddha was part of worship. Ikebana evolved from the Buddhist practice of offering flowers to the spirits of the dead. The first classical styles of Ikebana started in the middle of the fifteenth century; the first students and teachers of Ikebana were Buddhist priests and members. As time passed, other schools emerged, styles changed, and Ikebana became a custom among the Japanese society. 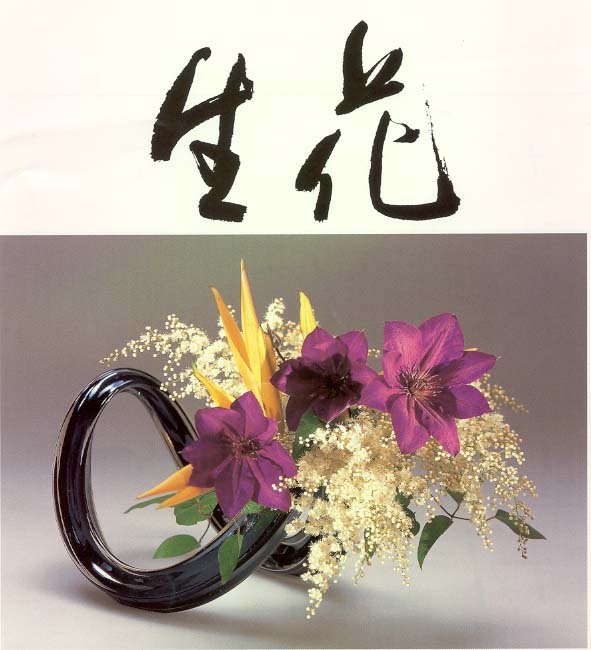 The history of ikebana dates back approximately 500 years to Ikenobo — the oldest school of ikebana. This school dates its beginnings from a priest of the Rokkaku-do Temple (六角堂) (the official name is Shiun-ji or Purple Cloud Temple 紫雲寺) in Kyoto who was so skilled in flower arrangement that other priests sought him out for instruction. As he lived by the side of a lake, for which the Japanese word is ‘Ike’ “池”, and the word ‘Bō’ “坊” meaning priest, they are contracted by the possessive parictle ‘no’ ”の” to give the meaning, ‘priest of the lake’, ‘Ikenobō’ “池坊”. The name Ikenobō became attached to the priests there who specialized in these altar arrangements. The Rokkaku-dō temple was erected in 587 by Prince Shotoku (聖徳太子; Shōtoku taishi). It is said that Prince Shōtoku was searching for materials to build the Shitenno-ji Temple (四天王寺). During his search, one day he went to bathe in a pond, where he hung a Buddhist amulet over a nearby tree. After his bath, he tried to remove the amulet, but he was unable to do so. That same night, the Prince saw the Buddha in his dream. The Buddha instructed him to erect a temple near the pond at the cedar tree under a purple cloud. From that cedar, Rokkakudō temple was built to house a Kannon (Guan-Yin) statue. Patterns and styles evolved so that, by the late 15th century, arrangements were common enough that they were appreciated by ordinary people, not just the imperial family and its retainers. Ikebana in the beginning was very simple, constructed from only a very few stems of flowers and evergreen branches. This first form of ikebana is called Kuge (供華). 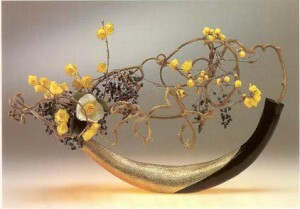 Styles of ikebana changed in the late 15th century and transformed into an art form with fixed instructions. Books were written and Sedensho is the oldest one, covering years 1443 to 1536. 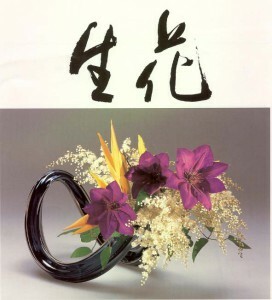 Ikebana became a major part of traditional festivals, and exhibitions were held occasionally. The first styles were characterized by a tall, upright central stem that had to be accompanied by two shorter stems. During the Momoyama period, 1560–1600, splendid castles were constructed. Noblemen and royal retainers did large decorative Rikka floral arrangements that were the most appropriate decoration for the castles. The Rikka (standing flowers) style was developed as a Buddhist expression of the beauty of nature. It includes seven branches representing hills, waterfalls, valleys, and other objects of nature arranged in a specific way. When the tea ceremony emerged, another style was introduced. The style used for tea ceremony rooms was called Chabana. The Chabana style is the opposite of Momoyama style and emphasized rustic simplicity. The simplicity of the Chabana in turn helped create the Nageire or “thrown-in” style. Nageire is a non-structured design which led to the development of the Seika or Shoka style. The style is characterized by a tight bundle of stems that form a triangular three-branched asymmetrical arrangement which was considered classic. Seika or Shōka style consists of only three main branches, known as ‘ten’ (heaven), ‘chi’ (earth), and ‘jin’ (human). It is a simple style that is designed to show the beauty and uniqueness of the plant itself. Jiyūka is a free creative design. It is not confined to flowers; every material can be used. Above is an Ukiyo-e woodblock print of Japanese Samurai performing and admiring Ikebana. The samurai way of life demanded a balance between aesthetic sensibility and military prowess, between bun (culture) and bu (war). Samurai were expected to excel in calligraphy, painting, and poetry in addition to the arts of swordsmanship, riding, and archery; to be as proficient in the tea house as on the battlefield. This workshop will explore the surprising connection between Bushidō and Kadō, the Way of the Warrior and the Way of Flowers (also known as ikebana) in Japanese culture. 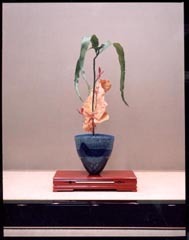 Many practitioners of ikebana feel that the spiritual aspect of ikebana is very important. One becomes quiet when one practices ikebana. It helps you to live “in the moment” and to appreciate things in nature that previously had seemed insignificant. One becomes more patient and tolerant of differences, not only in nature, but more generally in other people. Ikebana can inspire you to identify with beauty in all art forms — painting, music, etc., and to always expect the best in yourself.